Escalating tensions in a remote territory threaten to drag Pakistan into yet another conflict. As if Pakistan doesn’t have enough problems in the Federally Administered Tribal Areas (FATA) and in Balochistan, it now faces unrest in the territory of Gilgit-Baltistan. Gilgit-Baltistan is a mountainous territory in the Himalayas in the far northeast corner of Pakistan. It is home to 12 of the world’s 30 tallest mountain peaks, including K2 and Nanga Parbat. Pakistan considers it to be of extreme strategic importance because it borders ally China and is home to the only land route between the two countries. 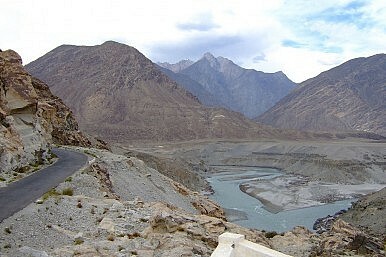 This route is the breathtakingly beautiful Karakorum Highway, the highest paved international road in the world. The region is also quite distinct from the rest of Pakistan, and indeed the world, in terms of its people. While Gilgit is inhabited by various groups that are related to but distinct from Kashmiris, Baltistan is inhabited by the Balti, who are a Tibetan Muslim group. Additionally, the Burusho people of the Hunza Valley speak a language unrelated to any other in the world. Most of the people of Gilgit-Baltistan are Shia Muslims, unlike the rest of Pakistan, which is mainly Sunni, making Gilgit-Baltistan the only majority Shia province or territory in Pakistan. The remoteness and distinctiveness of Gilgit-Baltistan in relation to the rest of Pakistan fuel both a sense of uniqueness and aloofness from the problems that have engulfed the rest of the country. This, however, has started to change recently. In June 2013, the effects of the Taliban insurgency suddenly spilled over into the territory, when about a dozen heavily armed Pakistani Taliban militants executed 10 foreign mountain climbers, including a U.S. citizen, at the base of Nanga Parbat. The tourist industry, one of the major sources of revenue for the region, has all but collapsed since then. This has increased the economic stress of the people in the region and brought out other grievances. Throughout last week, people in the region have been protesting the central government of Pakistan’s decision to withdraw subsidies as well as general governmental neglect. Pakistan has failed to invest in the region and provide even the most basic services such as education and healthcare. Many of these protests have made demands as simple as demanding ambulances for a town. At the heart of these grievances though is the frustration of the people of Gilgit-Baltistan due to their inability to make their own political decisions. The region is a territory and not a full province, like Sindh or Punjab. This means that the region does not have full control over key issues such as taxation, tourism, and the utilization of its natural resources. Its token assembly is largely symbolic, as its decisions must be approved by Pakistan’s federal government. Furthermore, the region receives none of the revenue generated by trade and customs duties with China — valued at half a billion dollars. As a result, many in the region feel as though they are being exploited like a colony. Pakistan justifies its treatment of the region by arguing that it does not make sense to fully integrate it into its system until its final status is resolved. The territory is disputed with India because it was a part of the erstwhile princely state of Jammu and Kashmir that is claimed in its entirety by both Pakistan and India. Nonetheless, Gilgit-Baltistan was very loosely tied to Kashmir and has a largely separate culture and administrative history, which is why its inhabitants believe that it should be made a separate, full province of Pakistan. The people of the region want Pakistan to make Gilgit-Baltistan a province so that they can enjoy full representation in Pakistan’s political system as well as a fair share of the revenue generated by their territory. They also want their borders opened up to trade with neighboring Afghanistan and India. Barring any move by the Pakistani government towards these ends, many in the region demand that they be granted independence instead. While this is highly unlikely given the strong Pakistani military presence there, Pakistan can ill afford yet another revolt in yet another region. Tensions are likely to continue to escalate if the region faces continued neglect. The Pakistani government would be wise to meet the aspirations of the people of Gilgit-Baltistan and make the region a full province. This would satisfy the people of the region and remove a major potential catalyst for revolt. At the same time, Pakistan has little to lose by doing so; the neighboring region of Azad Kashmir, also a vital border region administrated by Pakistan and also disputed with India, has a fully empowered legislature and government. Thus, there is no reason why Gilgit-Baltistan cannot be given the same treatment as Azad Kashmir or one of the four provinces of Pakistan.